Aspens are emblematic of our Alberta landscape and Bill has expressed the elements of these majestic and colourful trees in a contemporary context. Elements of movement and colour reflect the natural qualities of Aspens and the kinetic design of his sculpture allows it to move gently in the wind. The leaves, created from lightweight polyethylene, are brightly coloured to express the changing seasons and the translucent quality of the material captures sunlight. 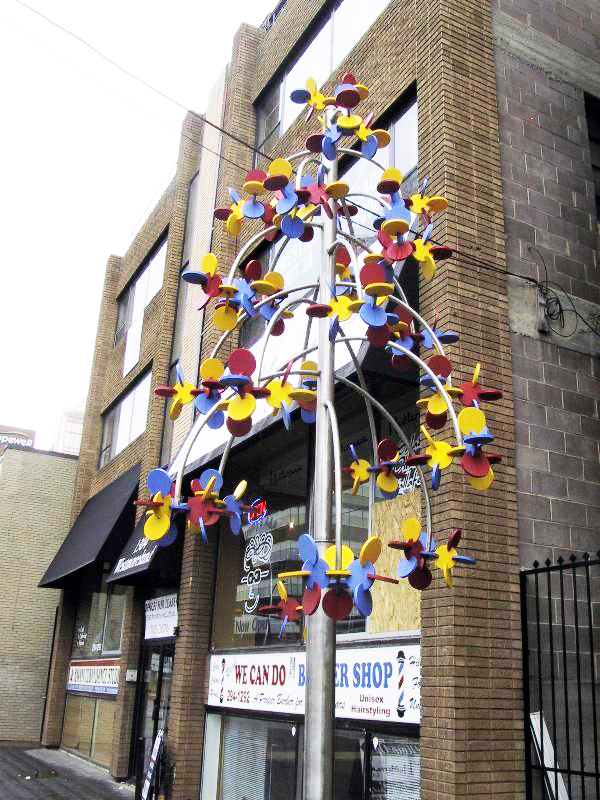 This sculpture invites a connection to nature by providing elements of these majestic and colorful trees in an urban setting. About the ArtistBill is a practicing architect and acquired his Masters in Fine Art from Princeton University and his degree in Architecture from the University of Manitoba. His career as an architect has enabled him to integrate the spiritual, intellectual and technical aspects of the creative challenges encountered in his professional life. Bill applies his creative talents in many artistic endeavors such as woodcarving, forged metal and coppersmithing.